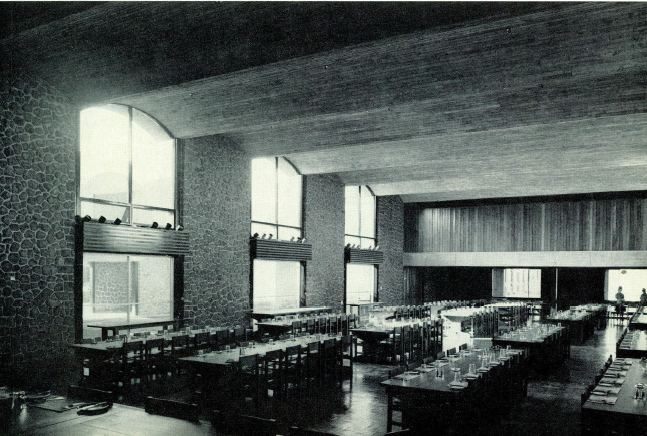 Robb College, Main Hall, 1965. Photo: Max Dupain. As reported on NBN news, “After five years of consultation, the University of New England says it will proceed with the replacement of Robb College. It was closed in 2014, due to its age and has remained vacant ever since, while a heritage listing proposal was assessed. The New South Wales Heritage Council has confirmed it will no longer be pursuing the proposal. Docomomo Australia and the AIA have made submissions to both the University of New England and the NSW Heritage Council. The Robb College was originally designed by Michel Dysart for NSW Government Architects in 1960. The building was completed in 1964. 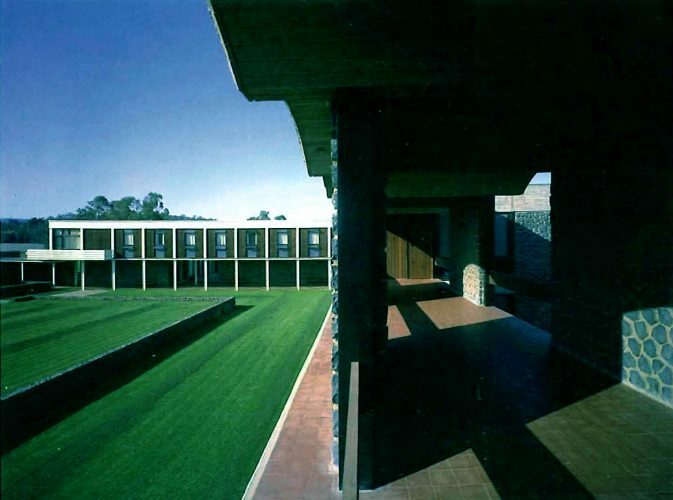 “Robb College is one of the first modernist college buildings to be erected on a university campus outside of Sydney. The use of the traditional quadrangle form widely employed for university colleges shows a renewed interest in the use of the Oxbridge model, rather than the American type campus planning of isolated buildings set in parklands. You can download here the text of an interview with Michael Dysart about the Robb College published in 2010, 50 years after the building was designed. On that occasion Dysart gave a lecture titled “The Manifesto of Natural Materialism: The Design of Robb College”, which, commented the UNE’s blog, recounts his initial impressions of the University and the architectural influences that shaped his design for UNE’s most distinguished modern movement building. In 1958, twenty-four year old Michael Dysart, newly graduated from the University of Sydney, was awarded a cadetship with the NSW Government Architect’s Office. One of his first jobs was designing a college for the University of New England. Established as the “Third College” after Wright and Mary White, Robb College was named in honour of William Menzies Robb, the first Registrar of the University. Although the project had a tight budget, Dysart showed great skill in avoiding bland homogeneity by creating a series of distinctive spaces. His work on Robb College received high praise in architectural circles, including from the influential critic Robyn Boyd, and attracted national attention. Dysart went on to enjoy a very successful career with a practice spanning domestic, government and commercial work. “In retrospect Harry was certainly influenced by the Dutch architect Dudok who, like Rembert, remained a public servant all his life and designed some memorable public buildings in Holland. “The use of natural materials was another fundamental in the design of Robb College in accord with the “Manifesto of Natural Materialism.” however there was an element of seriousness behind the jest. From my perspective the materials should remain true to their use without any artifice or cosmetic concealment” . On Robb College see also in the article Brutalism with a Human Face. 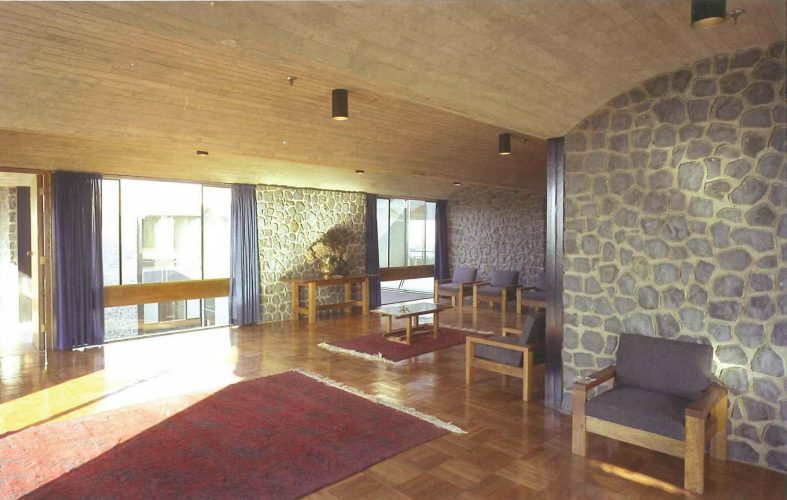 Case Studies of the Interior Architecture of Five NSW public buildings.